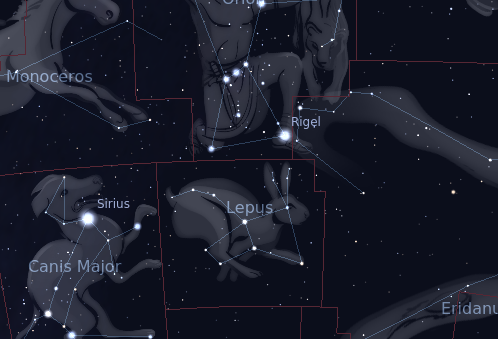 The constellation Lepus. Roll mouse over to see labels. 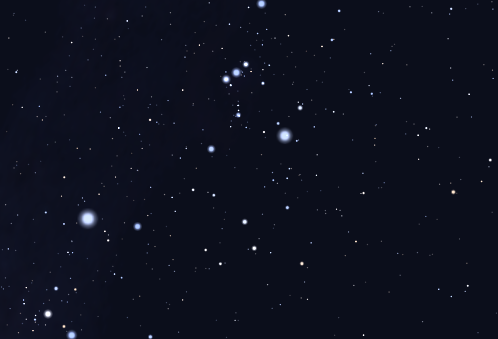 Lepus lies immediately south of Orion, where it culminates at midnight in the December sky. The name ‘lepus’ is Latin for hare, and the creature represented here is often said to be chased by Orion's two dogs, Canis Major and Canis Minor. For sure, the two dogs rise and set about an hour behind Lepus. However, the hare is not usually depicted in flight, but rather couched at the hunter's feet. Lepus is a relatively faint constellation: its brightest star is of third magnitude and is called Arneb, Arabic for ‘hare’. Its only Messier object is the eighth-magnitude globular cluster M79. Lepus contains the following Messier object: M79. The following constellations neighbor Lepus: Caelum, Canis Major, Columba, Eridanus, Monoceros, Orion.